In the last past decade, a range of novel observations in earthquake physics have highlighted transient changes of inherent properties of the medium associated with dynamic earthquake rupture (e.g., wave speed, hydraulic properties) followed by their gradual recovery. They hint a full non-linear hydro-mechanical coupling between dynamic earthquake ruptures and the surrounding off-fault medium and force us to revisit traditional models of earthquakes as slip on a frictional plane in a linear elastic media. ​To understand the long-term evolution of fault zones and therefore in order to be more predictive in term of seismic hazard, it is necessary to develop models that incorporate the mechanical response of the surrounding medium. This project aims to investigate the interplay between earthquake ruptures dynamic, off-fault damage and fault network connectivity to better assess seismic hazard. I have implemented the thermodynamically based micro-mechanical model of brittle failure at high strain rates developed by Bhat et al. (2012) that accounts for off-fault damage using micro-crack growth laws. I have integrated this model in an open source 2D Spectral Element code (sem2Dpack) that simulates earthquake ruptures along a geometrically complex fault system (Kaneko et al., 2008). In this study we have numerically investigated the role of spontaneous off-fault damage generation on earthquake rupture processes and underlined damage-related features that can be pertinent to interpret geophysical observations. The main difference with models allowing for plastic deformation is that the developed constitutive law accounts for dynamic changes of elastic properties in the off-fault medium, as observed along natural faults during earthquake and for laboratory experiments (e.g., Froment et al., 2014). 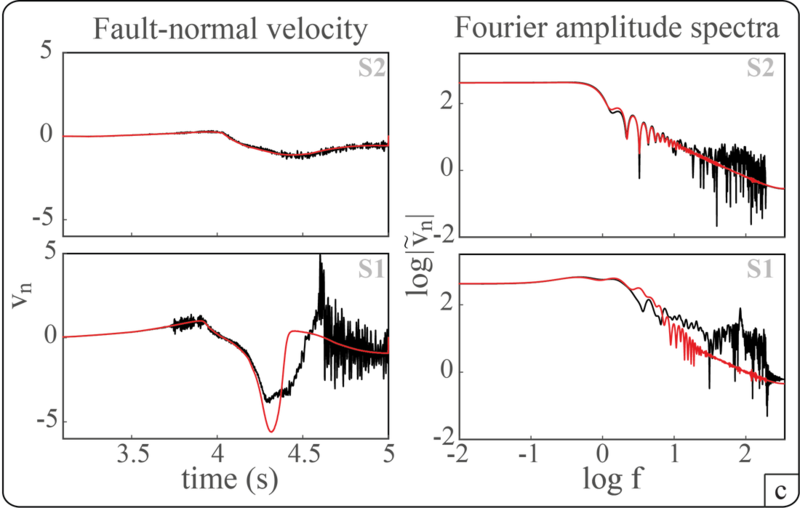 Dynamic changes of elastic properties during earthquakes generate intricate feedbacks between the off-fault damage generation and the dynamic rupture itself, that cannot be modeled with plasticity. Figure 1 Simulation of a dynamic rupture on a right-lateral fault embedded in a homogeneous medium (granite) with material contrast across the fault in initial damage density (D0). 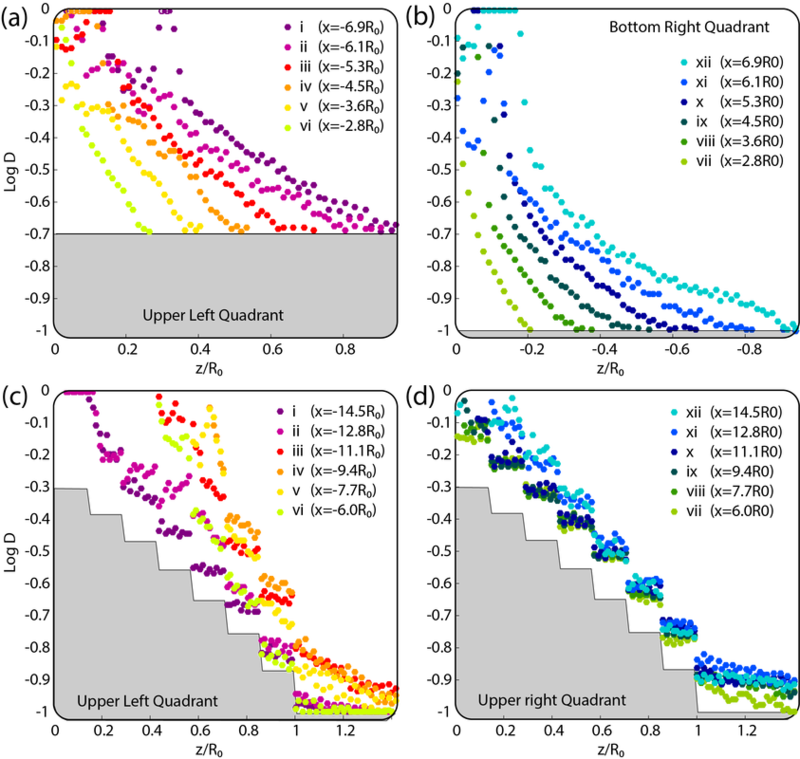 (a)Evolution of microcracks density (D ) at t=4.9s. (b) Reduction (in %) of S-wave speeds in the medium in relation to off-fault damage. (c) Synthetic seismograms of fault-normal velocity with the corresponding Fourier amplitude spectra (FAS). See Figure 1 for points' location. Black and colored curves correspond respectively to the dynamic simulation with off-fault damage and within a pure elastic medium.Paragraph. 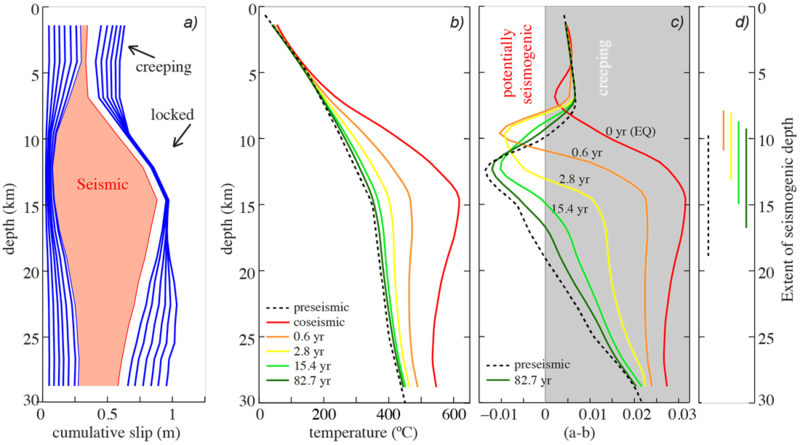 We demonstrated that the response of the damage elastic solid is different in the compressional and tensional quadrants with more damage in the tensile lobe (Figure 1a). This creates an asymmetric pattern across the fault, that is expected to increase over time if the fault ruptures in a self-similar fashion. Damage leads to dynamic change of elastic properties (Figure 1b), which In turn influences the slip rate on the fault with the development of slip rate oscillations. We have explored the combined effects of having a damage evolution law and a static bimaterial fault. Dynamic damage generation is sensitive to material contrast and the fracture damage introduces an additional asymmetry beyond that due to the associated elastic contrast. The asymmetry produced by the interaction between the rupture front and the off-fault damage can be opposite to that produced by velocity contrast and therefore cannot be modeled with a simple reduction in elastic stiffness. We have also explored the effects of off-fault damage on strong ground motion in the near-source region (Figures 1c and 1d). 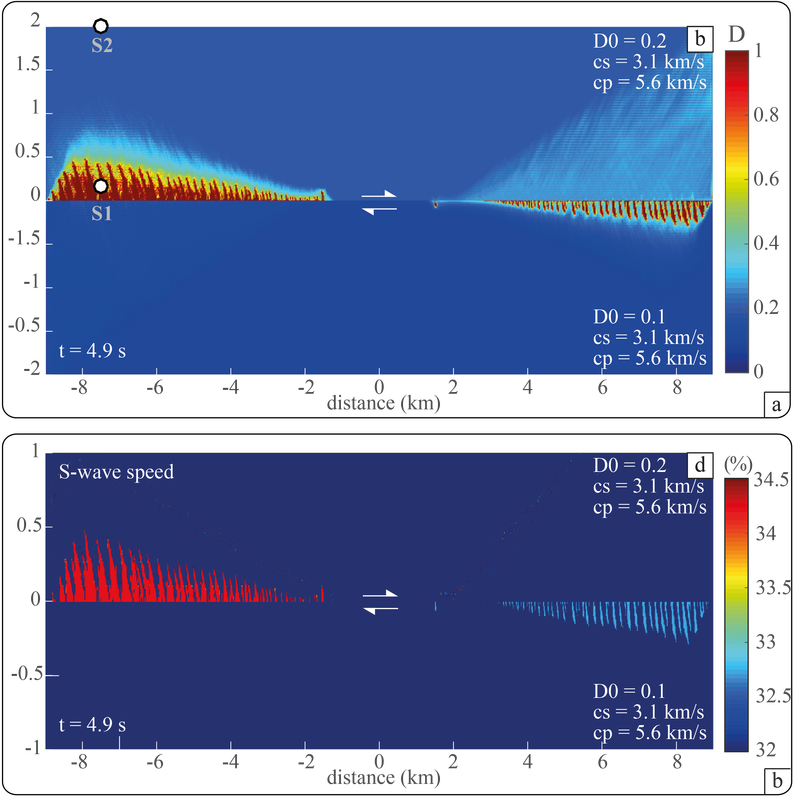 The high frequency content we observe in the velocity records are related to dynamic damage generation that induces a reduction in elastic moduli, and produces slip rate oscillations on the fault. It is compatible with strong motion records of real earthquakes and laboratory experiments observations (e.g., Housner, 1947; Wald and Heaton, 1994; Semmane et al., 2005; Dunham et al., 2011; Passelegue, 2015). These results are essential for seismic risk mitigation. Figure 2. Logarithmic damage density distribution as a function of perpendicular distance from the fault. (a) and (b) display the upper left and bottom right quadrant for the simulation of a dynamic rupture with a material contrast across the fault in D0: D0 = 0.2 on the top side of the fault, and D0 = 0.1 on the bottom. (c) and (d) display the upper left and upper right quadrant for the simulation of a dynamic rupture with a exponential decrease in D0 from 0.5 to 0.1 over R0 on the top side of the fault, and D0 = 0.1 on the bottom. The grey boxes gives the initial damage density distribution, D0, at the beginning of the simulations. M. Y. Thomas, and H. S. Bhat, 2017. Dynamic Evolution Of Off-Fault Medium During An Earthquake: A Micromechanics Based Model, Geophysical Journal International (submitted). M. Y. Thomas, H. S. Bhat, and Y. Klinger, 2016. Effect of Brittle off-fault Damage on Earthquake Rupture Dynamics, AGU monograph on “Fault Zone Dynamic Processes: Evolution of Fault Properties During Seismic Rupture”, v. 227, p. 255-280. Numerical models of the seismic cycle are powerful tools to explore the conditions for seismic and aseismic slip on faults. To a large extent, the current modeling efforts are focused on the frictional properties of fault planes and how they influence the seismic cycle. Models are based on the laboratory-derived rate-and-state (R&S) friction laws which allows simulation of many of the observed complexities of the earthquake cycle: from nucleation processes to dynamic rupture propagation (with or without enhanced weakening), postseismic and interseismic creep, transient slip events and re-strengthening between earthquakes. While these models are capable of reproducing many geodetic and seismological observations, one could ask, what controls the seismic or aseismic behavior of a fault patch. Does it depend on the lithology and the frictional properties of its constituents, or is it linked to the inherited internal structure of the fault gouge? Therefore, is velocity-strengthening or velocity-weakening frictional behavior a permanent condition? Can we imagine that, for the same lithology, depending on the micro-structure, temperature and pressure conditions a fault can switch from one behavior to another? In particular, lab experiments on illite-rich gouge have suggested that the variation along dip of frictional properties are likely related to the temperature variation (den Hartog et al., 2012). Figure 3. (a) Cumulative slip with depth on section A2 of the LVF, derived from kinematic inversion of geodetic data [Thomas et al., 2014a]. Isochrons of preseismic and postseismic slip are plotted every year (blue), whereas red shading corresponds to the 2003 earthquake. (b) Evolution of temperature with time along the fault plane. The preseismic temperature distribution based on Simoes et al. (black dashed line) is added to the estimated temperature increase due to shear heating during the 2003 earthquake, resulting in the temperature distribution immediately after the earthquake (red line). Then the temperature evolves through off-fault diffusion of heat. (c) The corresponding evolution of rate-and-state parameter (a − b) with time. (a(T ) − b(T )) is determined for each temperature profile, based on laboratory data [den Hartog et al., 2012]. Dashed line corresponds to the (a − b) profile before the event. (d) The corresponding extent of the VW zone with time. The goal is to include in BICyle, a physics-based numerical model of fault slip (Lapusta et al., 2000), a temperature dependency of frictional parameters with a heat diffusion law. In particular, we aim to investigate the influence of temperature-dependent frictional properties on the size, the magnitude, the frequency and the rupture propagation of earthquakes, In particular, we want to quantify the interaction of seismic ruptures with creeping segments and how it influences the postseismic relaxation. M. Y. Thomas, J.-P. Avouac, N. Lapusta, 2017. Dynamic modeling of earthquakes sequences on the Longitudinal Valley Fault: implications for friction properties, Journal of Geophysical Research-solid Earth, v. 122, p. 3115–3137.